Properties in Metropolitan City of Rome average 4.4 out of 5 stars. Massenzio, a little jewel in the heart of Rome, a stone's throw from the Colosseum. Property 1: Massenzio, a little jewel in the heart of Rome, a stone's throw from the Colosseum. Property 17: Domus Ciancaleoni New Red Suite 1st in Quality and Service. Not in Prices! A beautiful view apartment in the Historical Center - Navona square! Property 18: A beautiful view apartment in the Historical Center - Navona square! The Rome of Caesar and Michelangelo from an 18th c. building flat. Property 41: The Rome of Caesar and Michelangelo from an 18th c. building flat. Domus Ciancaleoni Mimise Suite 1st Cat. For Quality and Service but No for price! Property 42: Domus Ciancaleoni Mimise Suite 1st Cat. For Quality and Service but No for price! 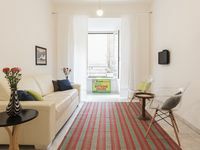 Elegant Apartment Ideal For 2 People In The Historic Centre Of Rome! Property 48: Elegant Apartment Ideal For 2 People In The Historic Centre Of Rome! My husband and I stayed in the Vatican Studio for a few days while we were exploring the city. The space is as pictured, very quite and it felt safe. WiFi worked great. It is just a few blocks from the Vatican and we had no problem finding wonderful restaurants close by. Our overall favorite gelato place ended up being just a few blocks away too. We appreciated Prisca's open communication and advice on how to get from the airport to the studio, a super easy bus. The studio is small, as described, it met our needs just fine. This was my first time staying in a VRBO and it was a long way away from home to try it out so-to-speak. The apartment was nice, clean and in a cute part of town. Trastevere is a very happening area with a lot of great places to eat and wine bars. It&rsquo;s a nice walk to just about anywhere you&rsquo;d want to go locally. It gets really busy at night, and can get a little loud but my husband and I enjoyed our stay. There was a hiccup with the arranged transportation from the airport, but Gabriel cleared it up and transport to and from the airport was seamless. I was a little confused about the VAT Fee as I thought I had already paid it at the time of reservation but there was an additional tourist tax at the time of check in. 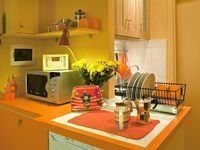 The apartment is in a good location, clean, safe and spacious for two people.